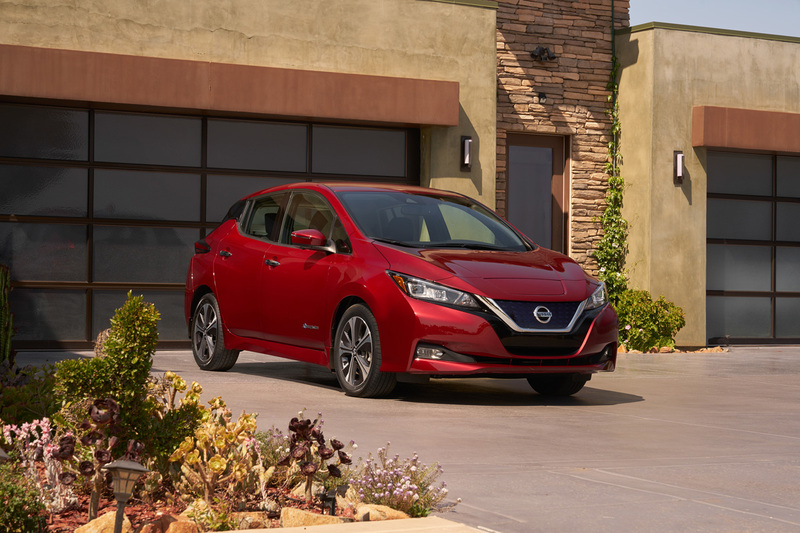 The second-generation Nissan Leaf has been unveiled, now with all-new styling inside and out, more power, more driving range and some new features to make it more attractive to EV buyers in an increasingly competitive marketplace. 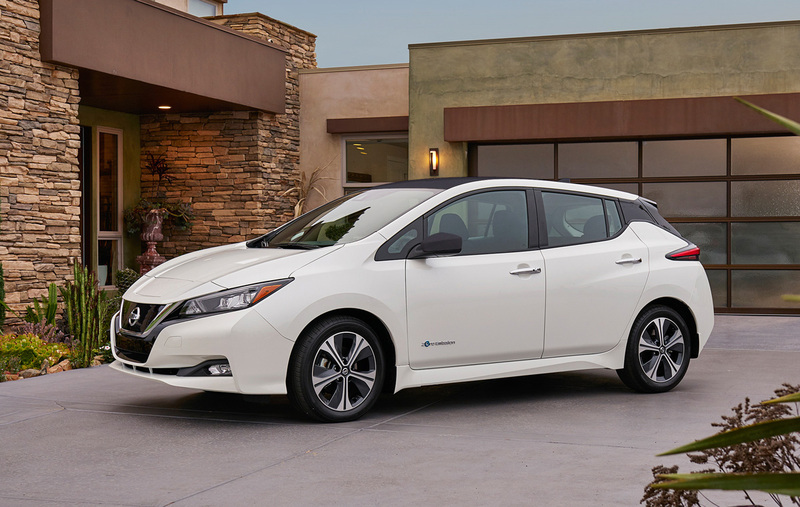 Starting at $ 29,990 and going on sale in the United States in early 2018, the second-generation Nissan Leaf represents a new paradigm for the brand’s first mainstream electric vehicle. 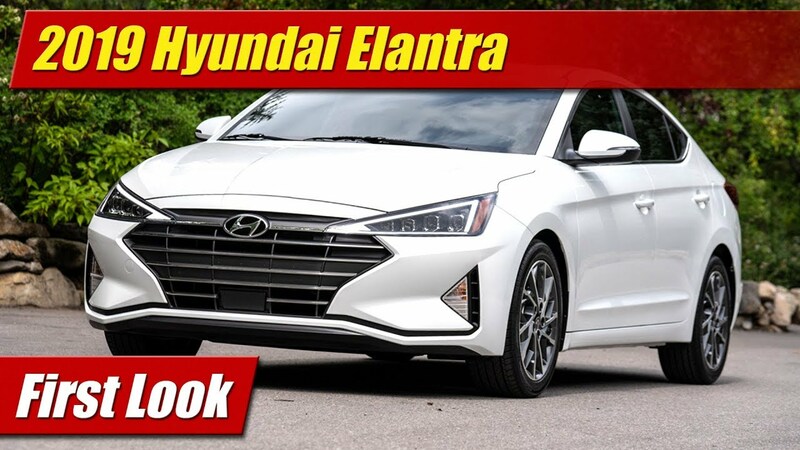 They’ve taken styling to the next logical step, increased its abilities, and brought its technologies up to par with today’s customer expectations. Styling is now arguably more traditional and mainstream than before, looking less like a cartoon character and more in line with Nissan’s showroom of designs. The V-Motion grille makes its appearance here, though with a unique twist to signify its uniqueness from the rest. 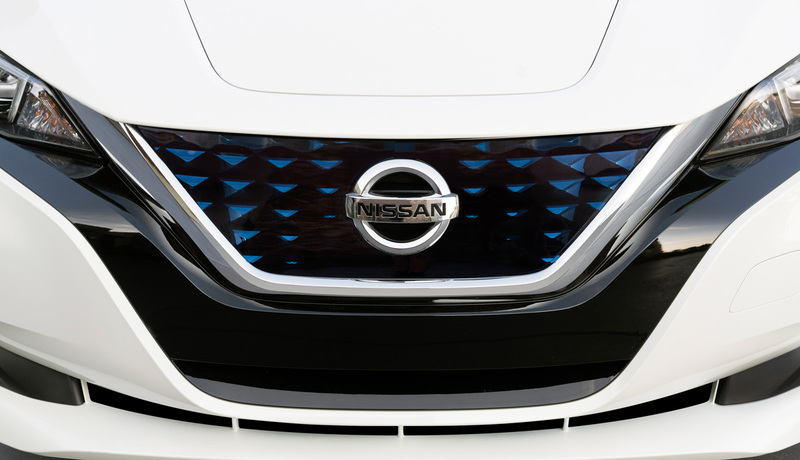 A more mature headlamp design features dual projector-beam lamps for high and low beam and the charging port still located on the nose now angles at 45 degrees which Nissan says allows drivers to plug in without having to bend over as much as before. 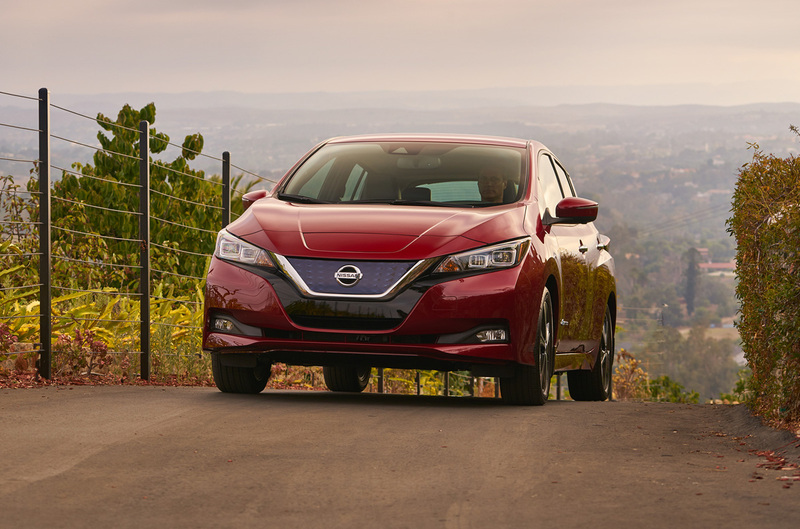 The floating roof theme of other Nissan products comes to the Leaf, tied into a rear hatch and glass that sits atop the boomerang taillight design language also seen across the Nissan lineup, though here again with its own twist. 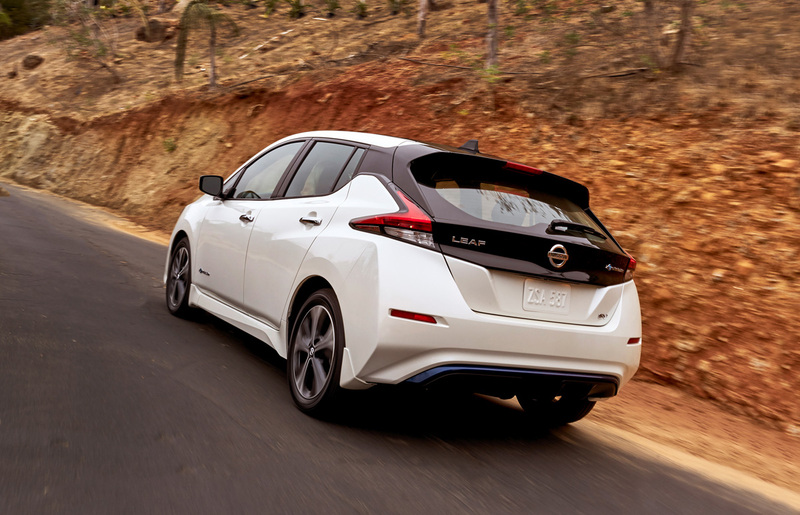 While it appears more upright and angular than before the new Nissan LEAF has a 0.28 coefficient of drag, the same as the previous-generation. 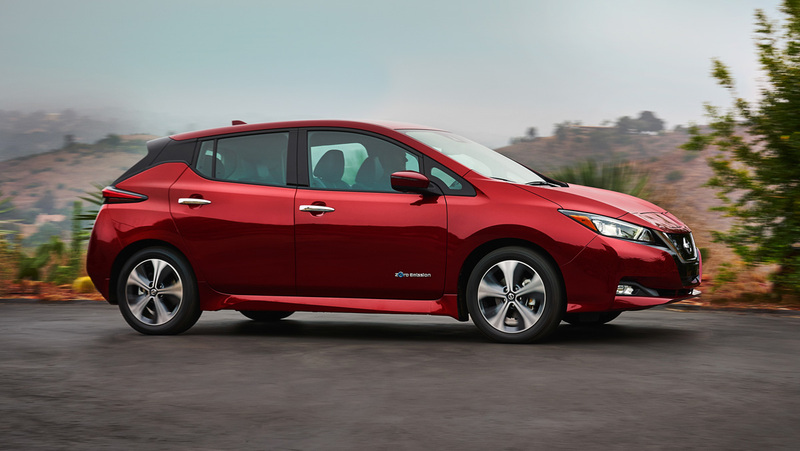 Powering the 2018 Nissan Leaf is a more powerful electric motor now with 147 horsepower, up 40 ponies. Torque gets a 26 percent increase as well to a healthy. to 236 pound-feet. When combined with a more powerful 40 kWh lithium-ion battery pack standard range is now increased to 150 miles. 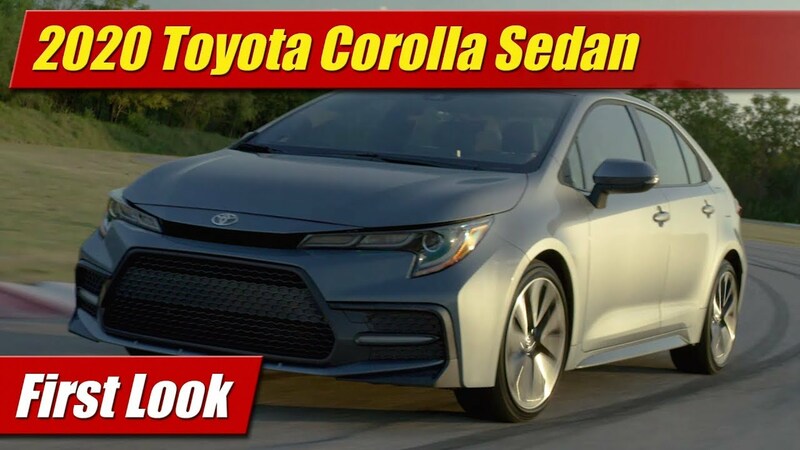 The new battery pack though more powerful remains within the same packaging envelope as before, sitting below the passenger compartment floor and seats front and rear – a design fast becoming mainstream in electric cars as passenger and cargo space is maximized. A low center of gravity results from this placement as well, which continues to offer the Nissan Leaf reasonably good handling. 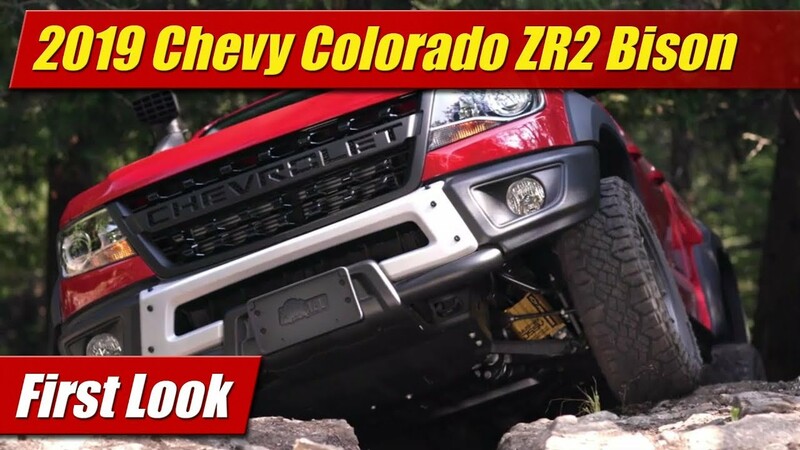 The chassis itself while largely carried over from the last generation does have enhancements to the power steering and suspension tuning for a more connected driving feel. 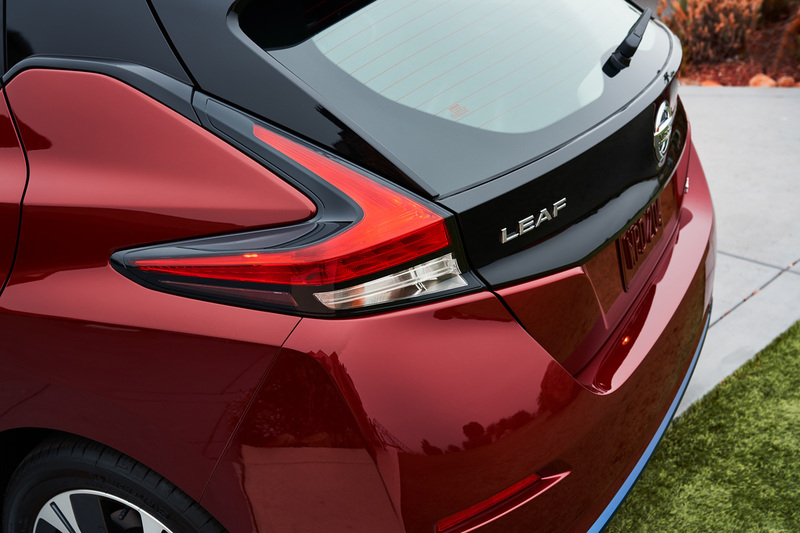 All-new to the Leaf driving experience however is the e-Pedal. 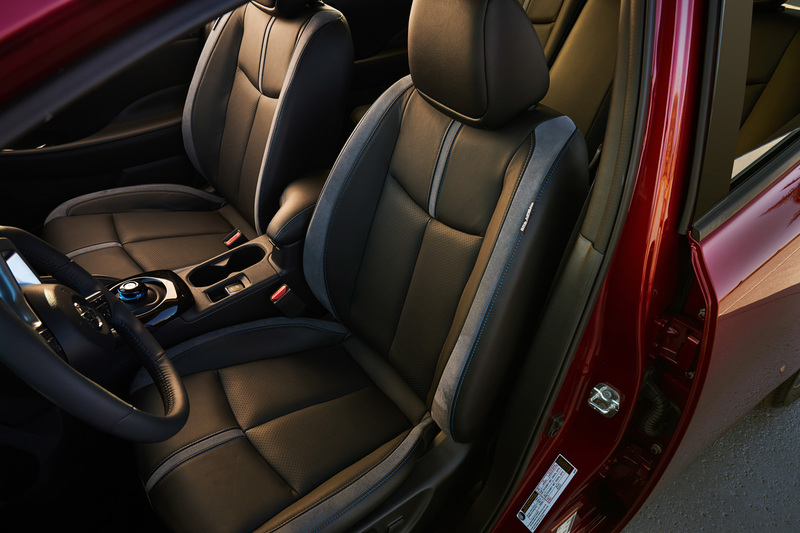 Similar to that found in the Chevrolet Bolt, lifting your foot off the accelerator pedal will bring the Leaf to a smooth and complete stop without using the brake pedal. 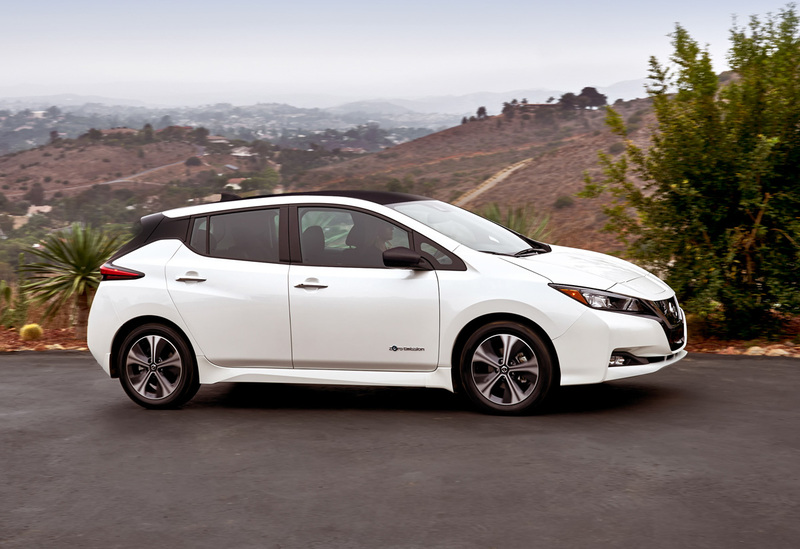 Once stopped, the Leaf will remain so even on hills until the accelerator is pressed again. It’s much akin to the power pedal in a carnival bumper car if you’ve ever driven one. On go, off slow down. While more aggressive and immediate stops will still require the brake pedal, the e-Pedal will allow drivers to manage stop and go traffic and most stop-light maneuvers without having to move back and forth from the accelerator and brake pedals, reducing driving effort and oh by the way increasing regenerative braking to recharge the battery. 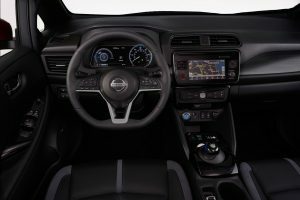 Also a headliner to the new Nissan Leaf is the brand’s ProPILOT Assist system which is essentially a package of radar based cruise control with automatic auto stop capability and lane keeping assistance, and a full list of other driver awareness minders to make life behind the wheel either effortless or strewn with annoying interventions from your car. Your take on it will depend on whether your are a type A or type B personality. Regardless of your psychology, you are likely to find the new interior pleasing to the eye and much like the exterior design, a tad more traditional in its themes. In fact it inherits the brand’s “Gliding Wing” interior design language as a baseline. 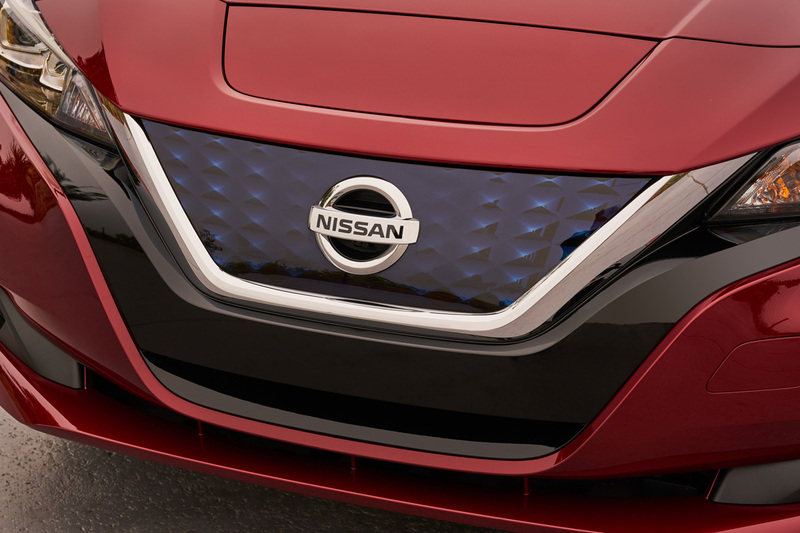 Unique to the Nissan Leaf however is the blue highlight stitching throughout, blue illumination and the modern high-tech toggle shift knob on the console for selecting your desired mode of forward, reverse or stationary motion. 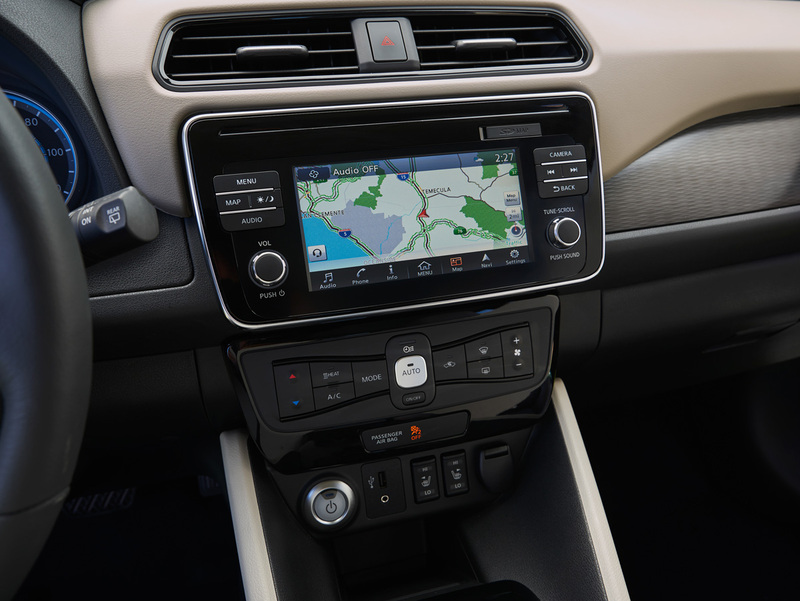 The center stack of controls has been simplified and enhanced with a new flush screen design that can now be had with Apple CarPlay and Android Auto, something new to the Nissan brand and a move that hopefully we’ll see it in the rest of their lineup soon. 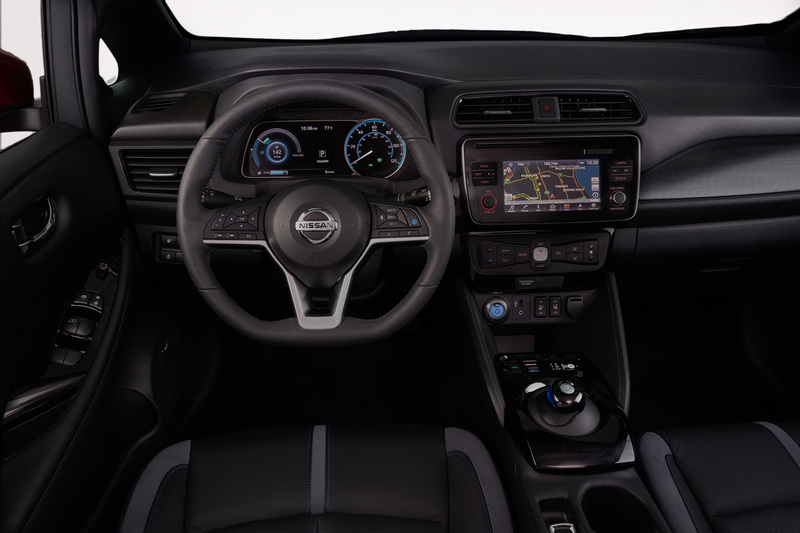 Ahead of the driver is a new TFT instrument cluster and dial that allows for multiple modes of customization to display anything from power modes to trip information, entertainment or the vehicle’s state-of-charge. 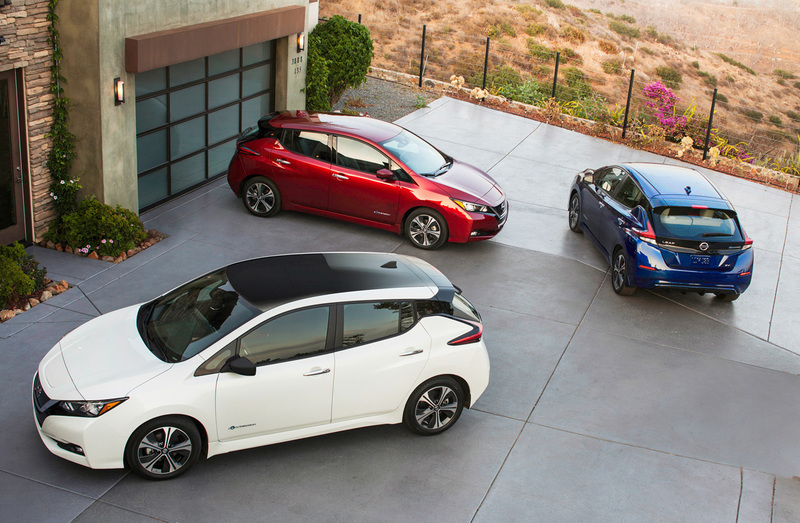 Room and space remains virtually identical in the new Nissan Leaf as the overall dimensions are largely unchanged. The rear cargo area is now flatter and more square, though optioning the top-end audio system does place a Bose sub-woofer right in your line of action. 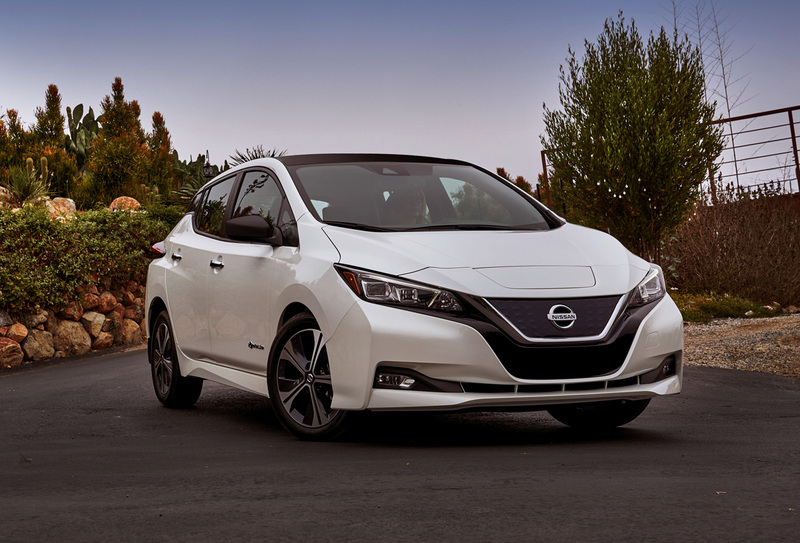 The new 2018 LEAF will be manufactured here in the United States at Nissan’s Smyrna, Tennessee plant goes in Japan this October. It will arrive in North American showrooms sometime early in 2018.